The development started early in 1994.The leading ideas i.e. the special bar code identification and the user interface using spoken messages were formulated very soon - probably also in 1994. The first goal in the work was to demonstrate that significant signal could be achieved from the electro-optical system within the desired range of operation. This could be done first theoretically on paper and then using slightly modified existing own products. The problem was that the existing equipment was far too heavy and consumed far too much electric power. At that time there was no doubt that these problems were solvable but - as usual money was the problem. For making the second to fourth prototype financial support was achieved from Trygghetsfonden, De Blindas Vänner and Siftelsen Innovationscentrum. But a large part of the time invested in this was unpaid... During the design work we have had much support from Syncentralen in Göteborg. A spin off project has been supported by Skyltfonden at Vägverket. This spin off is a technique to use the unit as a receiver for spoken messages from a kind of talking signs. This project is successfully finished. Ten units of the fourth prototype are manufactured. They are used for testing and evaluating purposes. Some results are already present from this work. One important result is that the user must have instructions to be able to get any use of this orientation aid like other orientation aids like the cane or the dog - mistakes have been done in this respect. After summing up these results a fifth version of the device is planned. The talking cane has been presented for a broader audience at two occasions. The first occasion was in march -98 in Göteborg. This caused a lot of interest in media and among branch people. The next occasion was at the 9th International Orientation and Mobility Conference in Atlanta in July 98. That presentation caused even more interest than in Göteborg. One reason was probably that i the U S there exists since several years a device called the laser cane, and the comparison became to our advantage. The Americans were especially impressed in the low weight ( !! ) the low price and the ability to identify bar codes. It became obvious that the name "laser cane" was not suitable. A more appropriate name is probably "the talking cane" which will be used in the future. In july 1999 patent was granted for the invention. In the nearest future help is needed from O&M teachers to find out how the talking cane is best used and if modifications are needed before the Mk5 unit can be introduced on the market together with a good manual for both teachers and students . It is also possible to develop a system where the talking cane is integrated with a talking sign system. This system should have a flexibility and a power that is not present in any system available on the world market today. The following text was written for the IMC9 conferance proceedings. Laser Orientation Aid for Visually Impaired, LOAVI is a device for mounting on the white cane, which works like an optical radar in the meaning that it emits light and detects reflections from the environment in an integrated receiver. LOAVI is able to detect and identify a special kind of signs at distances up to about 10 meters or even more in special cases. When the laser light hits a sign during the normal movements of the cane the user will hear a beep telling the user in which direction the sign is located. These beeps can help the user to find the location of the sign and thereby to find the way through difficult environments. The signs can also be identified as one out of 16 different types. That is made possible by designing the signs as a kind of bar codes made of broad or narrow strips of retroreflecting material. A microprocessor evaluates the signals from the optical receiver. If the microprocessor identifies the signal as reflections from this kind of bar code another kind of beep is heard. And if the user presses a button a recorded spoken message like "door" or "elevator" depending of the type of sign will be heard. The electronic and optic components are mounted on printed circuit boards and they are, together with two AA batteries, contained in an aluminium case with the outer dimensions 160 *37*27 mm. The receiver lens and the laser are located at the small end of the unit. The weight is of the order 200 grams. The unit can be clamped to the cane and adjusted for different "holding" angles. The mean current consumption is of the order 80 mA indicating a battery lifetime of about 12 hours for rechargeable NiMH batteries. The laser is a small diode laser emitting red light with the wavelength 670 nm. The mean power level is about 0.5 milliwatts. The LOAVI is classed in laser safety class 2. In laser safety class 2 there are no safety problems and no restrictions regarding the use. 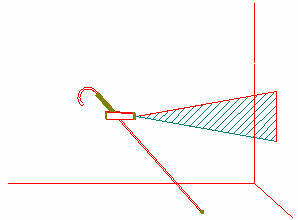 The emitted light is shaped by optics so that a vertical line can be seen if the light hits for instance a wall, see figure. The total spread angle is 20 degrees. (Compare to the normal case where the laser light is shaped as a collimated narrow beam forming a small dot when hitting a wall). At the front end of the device there is an optical receiver "looking" in the same direction as the laser. This receiver is only sensitive for light from the laser that is reflected in objects in the environment like the special bar code signs. The receiver is sensitive enough for detecting a standard bar code sign at 10 to 15 meters distance. The signs contain 4 vertical strips of retroreflecting material (the same material as on many road signs) mounted on a plate with outer dimensions 270 * 110 mm. "One, two, three, four, five, six, seven, eight, nine, door, men, women, store, elevator and information"
By listening to the beeps a visually impaired person can get access to information about the direction to an object several cane lengths away. This quality can be used when orientating on open areas inside or outside. The signs can be used as checkpoints along a path that a user wants to walk. They can also be used for labeling something that may be hard to find like an exit door from a big room. It is also possible to "read" figures using the LOAVI. For example the bus stop for line 8 could be equipped with the sign number 8. It is demonstrated that the receiver can be used for wireless receiving of voice messages that can be heard using the loudspeaker in the unit. One application of this technique is in connection with public traffic. The information flow that is available for seeing people on displays or monitors could be made available for the visually impaired by using this technique. A lot of work has been made to adapt GPS (Global Positioning System) as an orientation and navigation aid for visually impaired. Therefore it may be interesting to compare the kind of information the two systems can offer visually impaired people. Normally the output from a GPS unit is in the form of coordinates. These coordinates can be plotted into a map manually or automatically which may be a very good thing for seeing people. But to help a visually impaired person some further step is necessary. The best thing is of course to be in contact with a human being by a mobile telephone and this is demonstrated. It is also possible to build up a database that relates the coordinates to texts, for example street addresses. This is demonstrated for car purposes. The step that remains to get this information available for visually impaired is to transform texts to sound and this is also demonstrated. The GPS technology can thus offer a possibility to tell the user where he or she is with a resolution on the level "street address" or other descriptions of places when moving outside. The resolution of the relatively cheap and small units is of the order 100 meters but much better than that is possible by using more complicated technique. The LOAVI technique offers as explained earlier a way to find checkpoints in the near environment inside or outside buildings. A bit simplified we can conclude that a GPS tells you where you are while a LOAVI tells you where checkpoints are. This analysis indicates that the two systems will probably be used for somewhat different purposes and maybe complement each other. You can reach us by email on sten@opticalsensors.se.